Soaring 43 storeys above a stylish boutique retail podium, Scotts Square's modern architecture adorned with world-renowned art pieces makes it one of the most striking and distinguished homes in the heart of the Orchard Road belt. All 338 apartments boast stylishly appointed interiors and offer astounding views of the vibrant city skyline. The Club Floor on Level 8 pampers residents with a whole line-up of amenities including a swimming pool, jacuzzi, business centre, library and a concierge desk. These luxuries are topped off with the ultimate indulgence - a sky pool perched on the 35th floor commanding spectacular views of the city below. 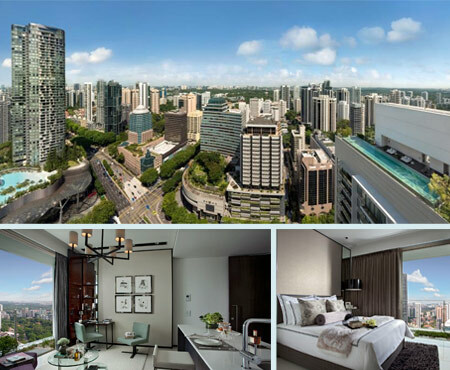 The two ultra luxury freehold residential towers of 35 and 43-storeys are among the tallest residential buildings in the heart of Orchard Road. For more information, please visit www.scottssquare.com. To register your interest in this project, please contact us at +65 6733 1188 or via our ONLINE FORM.